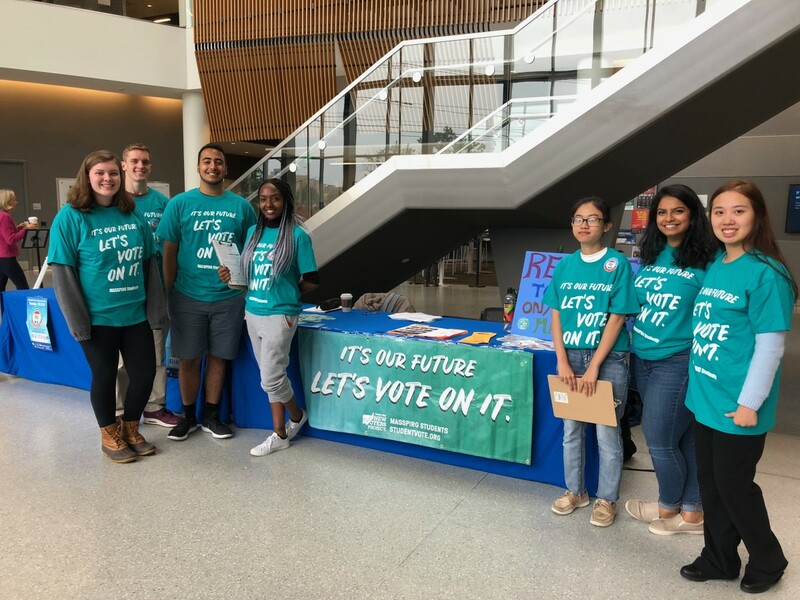 The Massachusetts Public Interest Research Group (MASSPIRG), UMass Lowell Democrats and the Public Higher Education Network of Massachusetts (PHENOM) hosted the 2018 National Voter Registration Day at University Crossing on September 25th. Organized by senior sociology major and MASSPIRG chapter chair president Ann Kurian, the event aimed to increase student participation in the polls by helping them register to vote, informing where local polling stations are located and partnering with other student groups on campus such as the UMass Lowell Republicans Club and the Student Government Association to increase the size of their coalition regardless of what their party affiliation is. “Students are ready to take action without waiting for legislature. We are working to get students excited and passionate about broader issues, as well as educate new voters and increase low voter turnouts,” said Julia Seremba, MASSPIRG campus organizer. According to Kurian, National Voter Registration Day is a nonpartisan holiday for democracy, counting on thousands of partners and volunteers across the political spectrum. Started over two decades ago, it is designed to create an annual moment when the entire nation focuses on registering Americans to exercise their right to vote. The group is well on their way to make their goal of registering 1,000 students by the voter registration deadline of October 17th for the November 6th elections. Throughout the coming days, they will be going to classes, tabling outside buildings and talking to as many students as they can. Keziah Ulanga, a junior biology major, feels excited as she walked around greeting students entering University Crossing. “Every vote counts no matter how you feel,” said Ulanga. PHENOM partnered with MASSPIRG on this effort to inform voters of their agenda on creating a debt-free education. Graduate student Elizabeth Plume and staff organizer Elizabeth Pellerito from the UMass Lowell Labor Education Program represented PHENOM at the event. Plume and Pellerito are working with other students to find ways to push student rights on student loans and fully funding public universities back on legislature’s agendas. Throughout October, they are hosting a campus student forum called Til Debt Do Us Part and a faculty and staff Debt Clinic that will focus on public service loan forgiveness. In the spring, a State House Advocacy Day is in the works. “If you want to talk to political leaders, a good first step is by voting,” said Seremba.